From circa 17 June 1700, her married name became Wodehouse. Children of Letitia Bacon and Sir Armine Wodehouse, 5th Bt. [S3683] Armine Wodehouse, International Genealogical Index (IGI) (unknown repository address: unknown repository, 1776). [S40] L. G. Pine, editor, Burke's Genealogical and Heraldic History of the Landed Gentry, 17th edition, (London, England: Burke's Peerage Ltd, 1952), page 584. Hereinafter cited as Burke's Landed Gentry, 17th ed. From 30 March 1769, her married name became Wodehouse. After her marriage, Sophia Berkeley was styled as Baroness Wodehouse of Kimberley on 17 October 1797. Hon. Charles Berkeley was born on 21 June 1701. 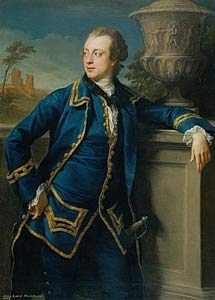 He was the son of William Berkeley, 4th Baron Berkeley of Stratton and Frances Temple.2 He married Frances West, daughter of Colonel John West, in 1745. He died in 1765.